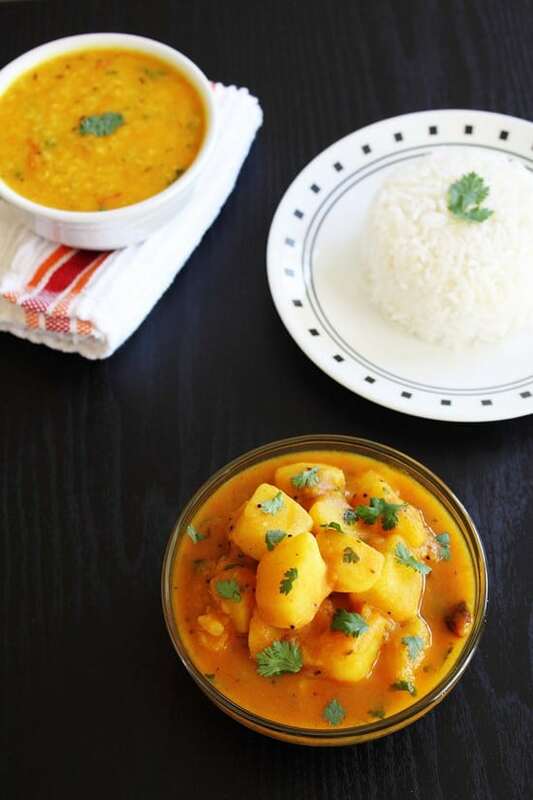 Batata nu rasawalu shaak recipe – It is nothing but the gujarati style of making potato curry. Very simple, quick and easy to make. For my non-gujarati readers, here is the translation. Batata=potato, rasawalu=gravy, shaak=Sabzi. So simply put together, potato sabzi with gravy, Gujarati style. As you know that Gujarati cuisine is famous for its spicy, sweet and sour taste. This curry has all these flavors. I have used tamarind and jaggery because my mom makes it this way. Yes, this is my dear mom’s recipe. This simple curry is must in the Gujarati thali (platter). No matter thali is from Gujarati restaurant or in wedding menu or feast at home. In our village, every wedding menu has this curry present. But in major cities, nowadays they become fancy and eliminate this simple, humble dish. But it always has special place in my heart. As you can see, for the sour taste I have used tamarind. But many add tomato for sour taste. 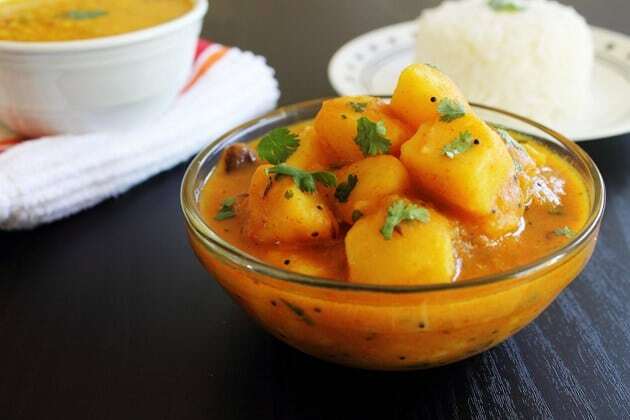 This is how my mother-in-law makes it.If you want to make it this way then add 1 medium chopped tomato along with potatoes like I have done in this aloo matar curry. I have tried and tested this ways too and I also liked it. You can adjust the red chili powder quantity as per your liking spiciness. 1) Heat the oil in a pan on medium heat. Once hot add mustard seeds. Let them pop and then add cumin seeds. Let them sizzle a bit. 2) Add dried red chili. Saute for 15-20 seconds. 3) Then add asafetida and turmeric powder. 4) Immediately add cubed potatoes. Mix it well. 5) Add coriander powder, cumin powder, red chili powder and salt. 6) Mix it so all the potatoes coated with the masala. 7) Add 1 cup of water. Stir it. 8) Cover the pan and cook. Stir in between and make sure that there is enough water and potatoes are not sticking to the bottom of the pan. If needed add more water. 9) Cook till potatoes are tender. Now mash very few potatoes with back of your spoon, so gravy will become thick. Add water if curry is too dry. 12) Mix it and let it come to a boil. Adjust the gravy consistency as per your liking. Add water if it is too thick and let it boil for 2 minutes. If there is too much water then let it simmer till it becomes thick. 13) Finally add some chopped coriander leaves. Turn off the stove. Let it sit for 5 minutes covered and then serve. 14) Remove it to the serving bowl, garnish with more coriander leaves. This batata nu shaak is life saver recipe for me when I am out of vegetables and potatoes are always there in the pantry. If you store this curry for next day, potato will soak up all the gravy. So you may need to add splash of water and then reheat it. Serving suggestion: Serve with roti/phulka or paratha. It also tastes best when paired with plain rice or moong dal khichdi or gujarati khichdi. Serve kachumber salad, chaas and roasted papad on side to make the complete meal. Once hot add mustard seeds. Let them pop and then add cumin seeds. Let them sizzle a bit. Add dried red chili. Saute for 15-20 seconds. Then add asafetida and turmeric powder. Immediately add cubed potatoes. Mix it well. Add coriander powder, cumin powder, red chili powder and salt. Mix it so all the potatoes coated with the masala. Add 1 cup of water. Stir it. Cover the pan and cook. Stir in between and make sure that there is enough water and potatoes are not sticking to the bottom of the pan. If needed add more water. Cook till potatoes are tender. Now mash very few potatoes with back of your spoon, so gravy will become thick. Add jaggery and tamarind paste. Mix and cook for a minute. Finally add some chopped coriander leaves. Let it sit for 5 minutes covered and then serve. Hope this site and recipes will be helpful to you. Simple and quick to make. You can send it to my event Only crazy for potatoes if you want.